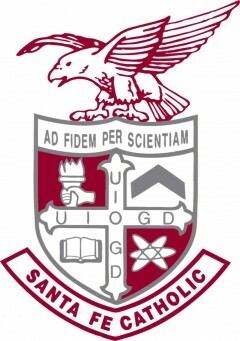 Santa Fe Catholic High School, founded in 1961, is a Catholic high school of the Roman Catholic Diocese of Orlando. 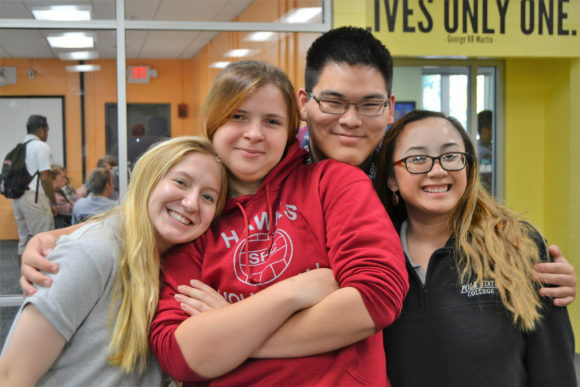 The school serves young men and women in grades 9 through 12. The 40-acre campus is located between Lakeland and Winter Haven and serves all of Polk County and the surrounding area. Though Santa Fe Catholic High School is a Catholic educational institution, families of all faiths find the school has not only an outstanding academic program, but also a very solid foundation of religious education and values. Together, these factors create an environment that promotes healthy spiritual, intellectual, physical, and social growth. We at Santa Fe Catholic High School embrace the challenge set forth by the Vatican in the statement, Catholic Education in the Third Millennium issued in 1999. We will embrace “courageous renewal.” We know and recognize that education today is very different than it has been historically. Technology continues to advance at astounding rates. Families are often more scattered and less cohesive than was evidenced even IO years ago. Issues like autism, ADHD, ADD, Aspberger’s Syndrome, Tourrett’s Syndrome and a myriad of other learning differences are being recognized and diagnosed with a far greater frequency. At this time in history when all aspects of life are changing and growing at unparalleled rates, we in education cannot afford to move slowly or we will risk falling behind the educational needs of our students and lose relevance. To be relevant today and in the future we must embrace a broad and demanding educational plan to ensure that our young people are well prepared for the world that they will enter and one day lead. The Santa Fe Catholic High School community believes that God is the creator of life and source of human rights and duties. In partnership with the Diocese of Orlando, Santa Fe offers a Catholic educational program vitalized by the truth that people achieve happiness by loving service to God and to others. Santa Fe Catholic accepts the responsibility of cooperating with other educational influences, especially the family, in the formation of the whole person -spiritually, academically, emotionally, socially, and physically in an atmosphere of mutual trust and respect. Our Motto: Ad Fidem Per Scientiam, To Faith Through Knowledge. Torch: Sign signifying knowledge and the enlightened meaning it gives to life. Chevron: Badge of honor, for excellence in both sports and academics. Book: Reminder that life is a period of constant study and only though application is a lesson learned. Atom: Symbol of progress and active participation in a modern world. Hawk: Finally, atop our emblem stands the hawk, our mascot, a bird of keen awareness, courage, and love of freedom.